During AEC’s 2017 Camp Meeting, Pine Forge Academy launched the PFA app! Stay connected to the Forge on the go! It’s free and relevant to everyone. 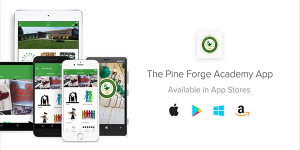 Visit your device app store today and download the Pine Forge Academy app! The 2015-16 school year was the inaugural year for IGNITE, the Academy’s e-newsletter. Ignite keeps current parents, alumni, and the greater PFA community informed of Academy events and supporting efforts. Sign up to receive our e-newsletter and stay connected! Additionally, you can visit and “like” the Academy on Facebook. The Academy’s Facebook page is updated frequently and is another great way to reconnect, stay informed, view images, and read posts from parents, alumni, students, and more.